This multiposition recliner with wheels offers tilt and recline features, smooth and effortless operation, and optimal positioning. 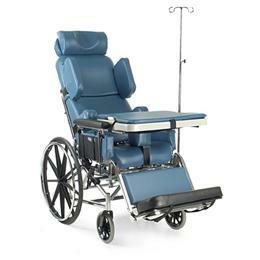 They are also designed to provide maximum safety for both the user and the caregiver.The HTR5500 features 24" rear wheels and 8" casters for maneuverability and controlled steering, contoured seat cushion, head wings, contoured headrest, lap tray and one-piece elevating footboard. Seat widths available: 16" and 18"
Seat depth : 16" - 20"
Seat to back height: 31"
Seat-to-floor height (16" -- 18"): 20" -- 22"
Overall depth (upright -- recline): 47" -- 56"